In 1920 Prandtl published an analytical solution for the bearing capacity of a strip load on a weightless infinite half-space. This solution was extended with a surrounding surcharge by Reissner and with the soil weight by Keverling Buisman. It was Terzaghi who wrote this with three separate bearing capacity factors for the cohesion, surcharge and soil-weight. Meyerhof extended this to the equation which is nowadays used; with shape and inclination factors. He also proposed equations for the inclination factors, based on his own laboratory experiments. Since then, several people proposed updated equations for the soil-weight bearing capacity factor, and also for the shape and inclination factors. The common idea is that failure of a footing occurs in all cases with a Prandtl-wedge failure mechanism. 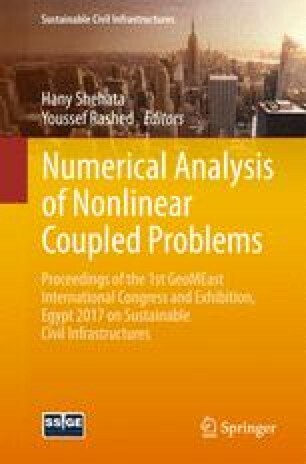 In order to check the failure mechanisms and the currently used equations for the bearing capacity factors and shape factors, a large number of finite element calculations of strip and circular footings have been made. These calculations proof that for some cases there are also a few other failure mechanisms possible. Also the currently used bearing capacity factors and shape factors are not correct. In fact, for footings on a soil with a higher friction angle, all three bearing capacity factors and all three shape factors can be much lower than the currently used values. This means that the currently used equations for the soil-weight bearing capacity factors and the shape factors are inaccurate and unsafe. Therefore, based on the finite element calculations, new equations have been presented in this paper.